Journalist Cormac Easton is chosen to join a group of elite astronauts as they take part in the very first manned mission into the furthest reaches of the solar system. Documenting the greatest journey of human-kind should secure his place in history as one of the outstanding explorers of the age. In space little ever goes to plan however and the crew wake up from hyper-sleep to discover that the captain is dead, seemingly killed by a fault in a supposedly fail-proof sleep pod. 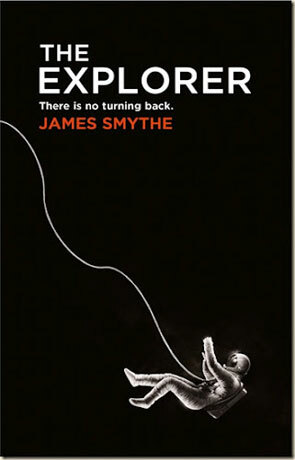 The mission must go on despite the setback however one by one each of the astronauts die in unlikely accidents until Cormac is left alone on a high tech space ship with no idea how to control it; spiraling towards his own inevitable death. All this happens just in the first chapter of the book! Back in 2009 a little film was released called Moon which starred Sam Rockwell in his finest performance yet as a lonely astronaut on a Moonbase, sending mined resources back to a depleted Earth. I finally got round to watching it last year and have to say that it is the single best science fiction film so far this century. It's a claustrophobic journey that offers a view on the nature of individuality and the human ability to cope with loneliness. Why am I telling you this? "The Explorer" reminds me so much of this film in many ways, it's a tense and claustrophobic journey that shares much with that cinematic masterpiece. It's got that same singular quality about it, the plot is just as thoughtful and evokes similiar feelings of awe. Narrated in the first person from the viewpoint of someone who is very non-technical works fantastically, we only learn what Cormac does as he stumbles through this mission through the solar system. While he may not be very technically competent Cormac is an intelligent, professional journalist and the book centers around how he copes with the journey into the unknown; with personal despair, loneliness and ultimately death. It's the way the author does this that makes the book so special, I'd rather not give too much away (I always try to avoid that in my reviews) - but through some exceptional characterisation and rich dialogue he convinces the reader that these are real people leading real lives. We get to see the little details of living aboard a spaceship, surviving in a weightless environment and living in close, cramped quarters. After the first chapter the story really gets going and the plot keeps you guessing, playing with the reader (and characters) lack of knowledge to great effect. As the book progresses the bits you've read previously begin to make sense and this is inter-spaced with trips back to Cormac's past before he began the ill-fated journey. If it's the characterisation that makes this book irresistible then it's the way the plot is handled that seals this book as a classic. While the science fiction tropes themselves have been used before, the execution is faultless and the ending simply inspired. The whole feeling of traveling on a spaceship into the deep unknown combined with the incredibly talented, subtle and yet emotionally gripping writing creates a powerful, engaging and above all entertaining science fiction novel, highly recommended. Written on 16th November 2012 by Ant.